Big Wolf is a powerful and dynamic guitarist and singer / songwriter who is fast becoming one of the must-see artists on the scene. Spontaneous, improvised breaks, dynamic highs and lows, bringing a song down to a whisper before exploding with energy and power. His music created an old school feel, something which the industry has lost along the way. 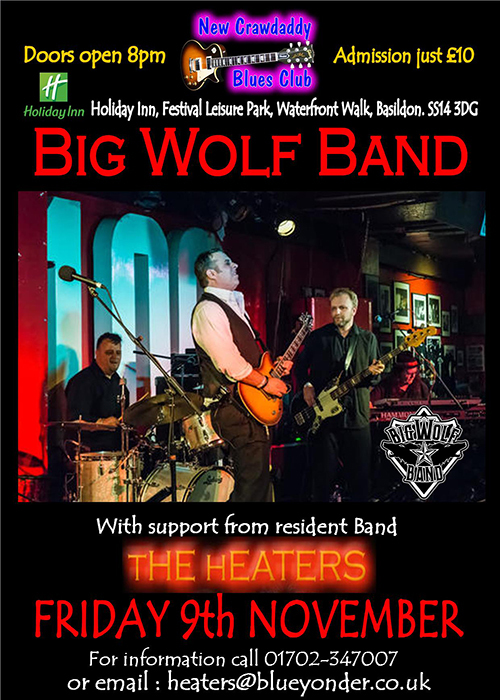 Original songs from blues through to rock, all with that unique Big Wolf feel, backed by an outstanding band, Big Wolf delivers every time. If you want a band that can capture the imagination, then look no further. The band consists of Jonatan Earp, guitar |& vocals, Mick Jeynes, bass, Paul Brambani, keys, and Tim Jones on drums.